Heat oven to 375°F (350°F for glass pan). In 4-quart saucepan, heat soup, broth, turkey and vegetables to boiling, stirring constantly. Boil and stir 1 minute. Spread in ungreased 13x9-inch pan. In medium bowl,stir remaining ingredients until blended. Pour evenly over soup mixture (crust will rise during baking). Bake about 30 minutes or until light brown. 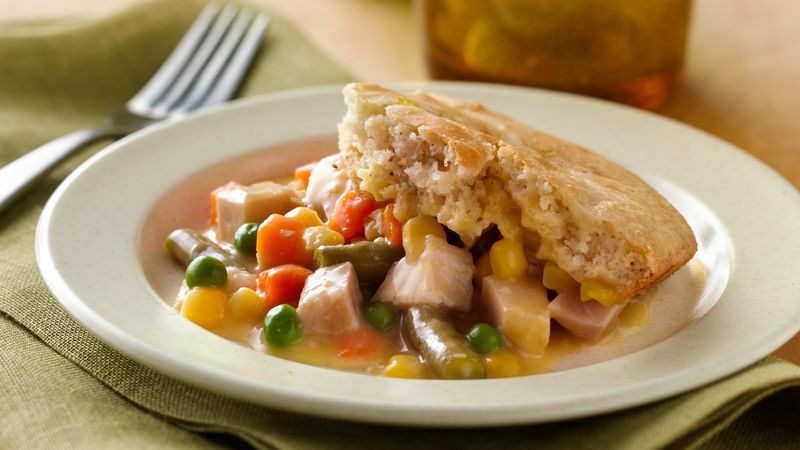 Try a variety of mixed vegetables and condensed cream soups, depending on your taste and what you have on hand. To accurately measure dry ingredients such as Bisquick® mix, spoon into a standard dry-ingredient measuring cup, then level the top with a straight-edge utensil. Take care not to scoop it or pack it down.